← Topinambour, the Jerusalem artichoke now called sunroot. Months including an “R” is the best time to eat shell fish, the saying goes. This is not only a safety recommendation, the hot months have no “R”, but also a matter of taste. 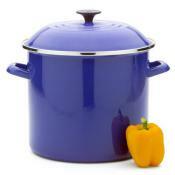 The colder the water, the better for mussels, oysters, crabs, and other mollusks and crustaceans. So, I bought a large tray of fresh mussels from Prince Edward Island, 2.74 Kg to be precise. That is a huge amount to deal with, but I am well equipped to deal with party quantities with a huge Le Creuset stock pot. It came in handy. First step is to make a broth in the stock pot to cook the mussels. About 3 inches of water, 1 tbsp sea salt, pepper, 2 tbsps wine vinegar, one bay leaf, thyme, one small onion chopped and two tbsps of powder vegetable stock. Boil for 10 minutes, add the mussels and wait until the shells are open. Drain them but keep the stock. The rule about mussels is as follows. Throw out all the mussels that are wide open and look dead before cooking and all the mussels that did not open during cooking. Check before cooking if they need a rinse. Sand in the sauce is not so good, but if they are clean don’t bother so you retain all the flavour. 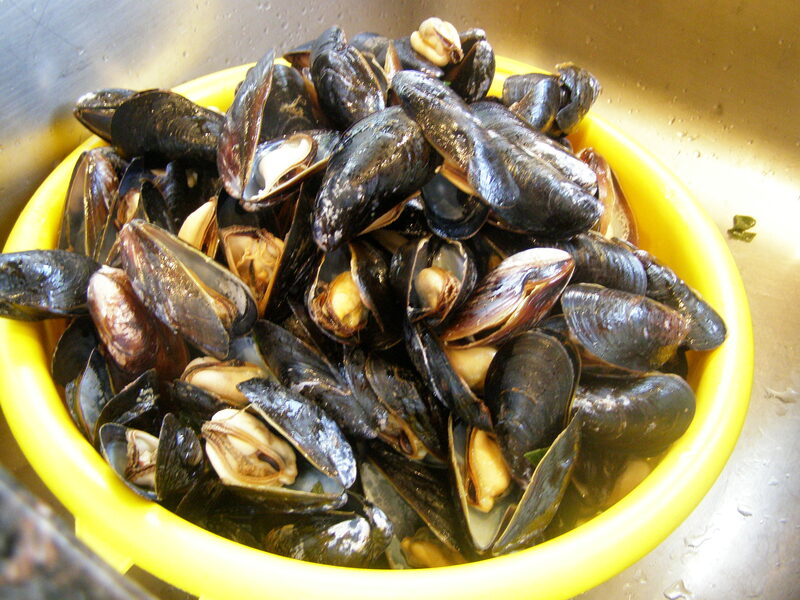 When they have cooled down, remove and discard the shells and keep the mussels in a bowl. Next, or before cooking the mussels, you have to make the sauce/soup. For that I chopped one whole sweet onion, 4 cloves garlic, 1 yellow pepper, one red pepper, 1 leek, 1/4 cup parsley, and one bunch of spinach, stems cut-off. I cooked this on low heat with olive oil until all tender. 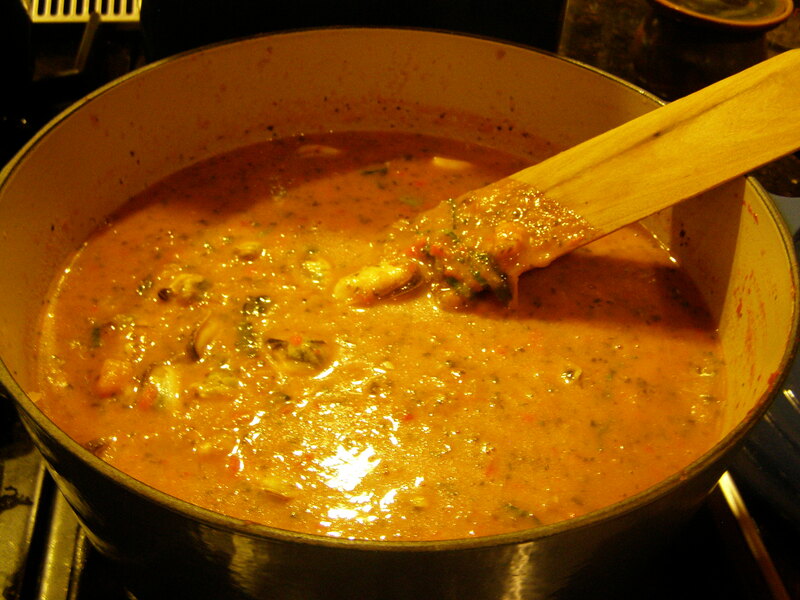 Then, I added a can of tomato paste,( during the month with an “R” the tomatoes have no taste and a can is better), 1/2 cup chopped fresh basil and all the broth from cooking the mussels. (Check if it needs straining). Simmer gently for another 10 minutes, add Frank’s hot sauce or Cayenne pepper, and last the mussels and another sprinkle of chopped basil. Serve as soon as the mussels are hot. Optional: 1/2 cup cream, not required, definitely optional, add at the very end. Optional if you have left-over kicking around, a cup of white wine in the broth to cook the mussels. This entry was posted in Appetizer, Lunch, Main Course, Soup and tagged food, French mussels recipe, mussel soup, mussels in sauce, recipe, recipes, soupe de moules. Bookmark the permalink. I’ve honestly never had mussels, but I am a big fan of shellfish in general. This looks like one fantastic and rich velvety soup. Lots of great flavors there.